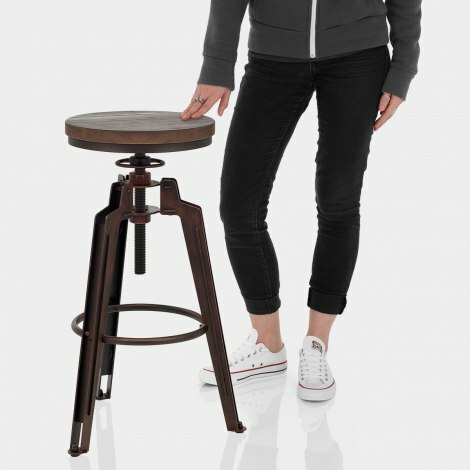 An industrial twist on the simple three-legged stool, the Trio Stool Antique Copper has stylish individuality. Its unique design combines with an exclusive finish to create an original piece with character and personality that will instantly update your interior. Its backless solid wooden seat boasts a rustic round design that is ideal for tucking away after use. The dark finish also matches the stylish frame finish below. Height adjustability is made easy with the locking screw thread below the seat, and you can also turn through 360-degrees. Eye-catching and original, the Trio is true to its name and features a three-legged metal frame. Emphasising the factory-style appearance, the frame has a distressed black finish with a copper sheen that shines through when the light hits. Mirroring the round seat, the circular footrest braces the legs and lends a stylish support for the feet, while protective pads preserve floor surfaces.